Home to the longest running and most comprehensive studies of women in film and television. Download a high res version of the Then and Now Graphic. 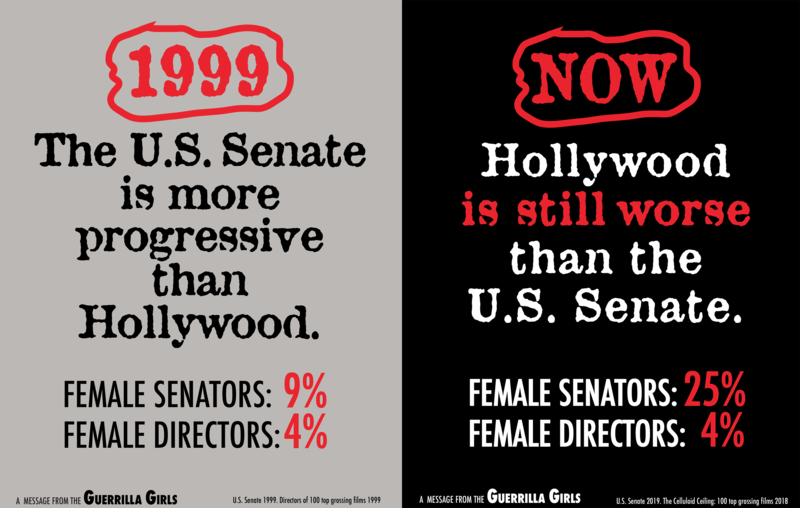 Women have made substantial gains as U.S. senators but not as film directors over the last 20 years, according to a new social media campaign by the New York-based Guerrilla Girls and the Center for the Study of Women in Television and Film. “The film industry continues to lag behind even our most staid political institutions. The side-by-side comparison offers a way of conceptualizing how little Hollywood has changed over the last two decades. While numerous media outlets dubbed 2018 the ‘year of the women’ due to the upsurge in the number of women who ran for and won political office, the same can’t be said for the employment of women as film directors,” states Dr. Martha M. Lauzen, executive director of the Center. This reality has been documented by the annual Celluloid Ceiling report, now in its 21st year. It is the longest-running and most comprehensive study of women working in film available. The project tracks women’s employment as directors, writers, producers, executive producers, editors, and cinematographers on the top 100, 250, and 500 (domestic) grossing films. In 2018, women comprised just 4% of directors working on the top 100 films, 8% on the top 250 films, and 15% on the top 500 films. Founded in 1985, the Guerrilla Girls use facts, humor, and arresting visuals to point out ongoing gender inequities in politics, film, art, and popular culture. The organization took up the cause of women working in the film industry in 1999, and introduced a sticker campaign at the Sundance Film Festival in 2001, followed by billboard campaigns in 2002, 2003, and 2006. 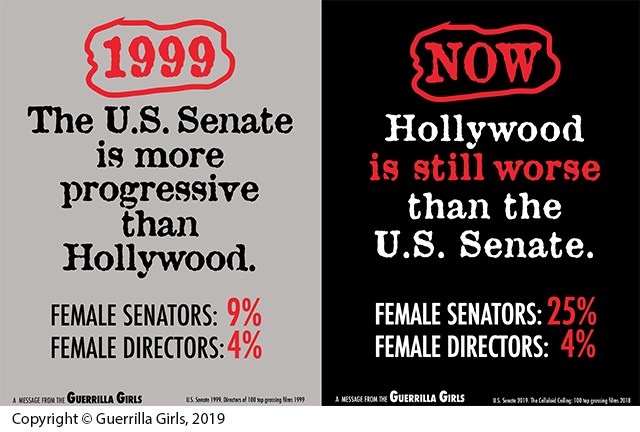 To learn more about the Guerrilla Girls, visit guerrillagirls.com, twitter.com/guerrillagirls, instagram.com/guerrillagirls. © 2018 Dr. Martha Lauzen. All rights reserved. If you are unable to access the contents of this website, please contact Dr. Martha Lauzen.